For the 53rd edition of the Carnival of Genealogy, which is a carousel edition, I thought I would go back to the theme for the 47th edition, in which I didn't participate. I couldn't decide what to write about at the time. The theme was "A Place Called Home." We were to describe a place where our ancestors lived. I know a few names of European towns where my immigrant ancestors came from, but little more than that, and I didn't have the time to do the research. Many of the immigrants settled in St. Louis, which is where I have spent all but a few of my college years so I didn't think about it as an ancestral home. 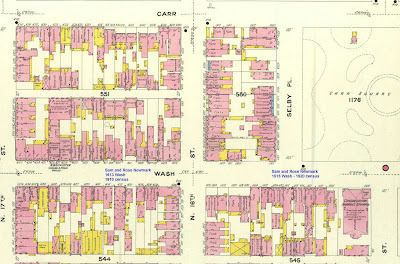 However, a couple months ago I found the St. Louis 1909 Sanborn Maps online, and since I knew street addresses for where my great-great grandparents were living at the time, mostly gleaned from city directories and the Census, I downloaded the specific maps for their neighborhoods. A week ago I started doing some research on the neighborhood for the Newmark family. The Newmarks immigrated in 1909, and in the 1910 and 1920 census Samuel and Rose Newmark, my great-great grandparents, were living on Wash Street, a block or two West of Carr Square Park. The blue writing on the image is where I have marked their 1910 and 1920 addresses. 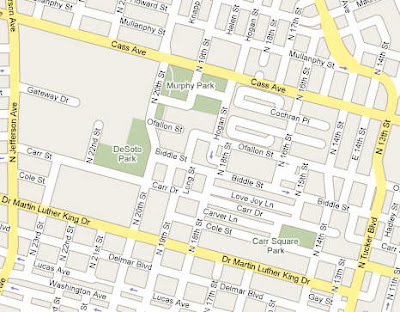 Wash Street is now Cole Street as can be seen on this map - courtesy of Google. The park still exists. I've actually driven by several times. The United Way of Greater St. Louis is located at 11th Street and Cole. The quickest route to business meetings I've attended there takes me straight down Cole. "In 1908, the Civic League of St. Louis conducted a study of a slum neighborhood. Known as Carr Square, one area contained as many as 1900 residents per acre. The average living space was 16.9 square feet per person. There was an average of one bathtub and four toilets for 2479 people. The average rent was $1 a week. Human waste and garbage accumulated in the few open spaces. And in these ill-ventilated, foul-smelling shacks and cellars were found saloons, bakeries, groceterias and laundries." The article above didn't provide the boundaries of the Carr Square neighborhood that was studied by the Civic League. I realized it may not have included the tenements my great great grandparents lived in, but since they lived near the park with the same name, I knew it was likely close. I searched online through some local library catalogs looking for this report. I had no luck, and broadened my search, and struck paydirt - I found a report online - at Harvard, of all places. I downloaded it. In my glance through the 90 pages I am unable to find a reference to the Carr Square neighborhood, so I'm not positive it is the report referenced in the article on orphanages. It's possible Carr Square was mentioned in an associated report. However there are almost 90 pages on a section of St. Louis City that lay a couple blocks East of where Sam and Rose Newmark lived. The study says the area is representative, though of other sections of the city. 7th and 14th Streets are the East/West borders. While Sam and Rose were outside the boundaries, within the boundaries is the corner of 8th Street and Biddle where my other great-great-grandparents, Selig and Annie Feinstein, lived between 1896 and 1906. 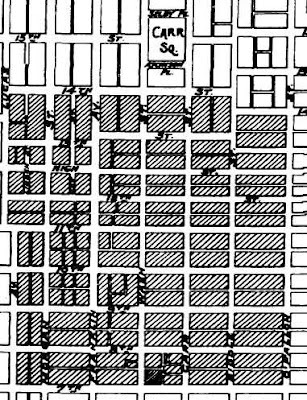 (It's a little hard to read, but Biddle Street is the second street from the right on the map) My great-great grandparents Morris and Minnie Cruvant lived at 7th and Biddle in 1897. And the last set of my paternal great-great grandparents, Morris and Mollie Blatt, lived at 10th and Biddle in 1896. It's possible the conditions were different ten years prior to the study when the Blatts and Cruvants lived there. I doubt they were very different for the Feinsteins two years prior to the study. The disturbing image of a shared wall between a privy and a bakery oven, which I posted on Wednesday, came from this report. There are other equally disturbing images, and descriptions. It's difficult to imagine living under these conditions, but it is clear half of my ancestors at least did so in the early 1900s. As a historical note -- if you look at the Google Maps image above, you will notice the area west of 20th Street bordered today by Cass and MLK Jr. Drive, there is a lot of land unbroken by roads. In the 1950s the buildings there were torn down and an infamous housing project was built by the same architect who would later build the World Trade Center -- Pruitt-Igoe. Note: Further reading of the report indicates the statistics in the report match up with those in the paragraph quoted from "Beyond the Orphanage" - therefore the "Carr Square" neighborhood references the entire neighborhood covered by the 1908 report. Some of my ancestors were in that same general area (e.g., Cass, Biddle) before moving a few blocks westward and then, not surprisingly, getting the heck out of the neighborhood altogether. A hundred years later and it's somewhat improved (can it be worse than the description you quoted? ), but have you ever gotten out of your car there?